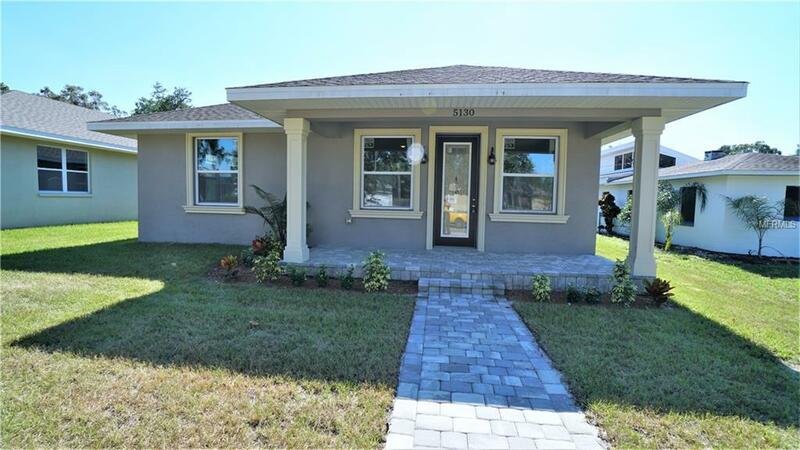 Beautiful brand new construction in the heart of St. Petersburg! This 2100 sq foot home contains 3 Bedrooms, 2 Bathrooms and a 2 stall attached garage with alley access. You'll walk right in to luxury vinyl plank flooring through out the entire house. Kitchen includes Samsung stainless steel appliances, solid wood cabinets, granite countertops, and extra hidden storage in the large eat-in island. The open floor plan allows you to enjoy both your kitchen and living room at the same time. Master bathroom has a separate shower and bathtub with high-quality tile, brushed nickel bathroom fixtures, and a spacious double vanity also with plenty of storage and granite counter tops. Master bedroom has a walk in closet and direct access to it's own private back patio area. Bathroom 2 contains a bathtub/shower combo, single vanity with granite counter tops and solid wood cabinets with available storage as well. The builder had double pane hurricane impact rated windows installed which do wonders for cancelling outside noise as well as improving energy efficiency. Please schedule a showing of this home while it's still available!